Legends are brought into the spotlight for their achievements. We know them in that specific moment of history. But do you ever wonder what they were like before that specific moment of history? Were they always that person we know and love? 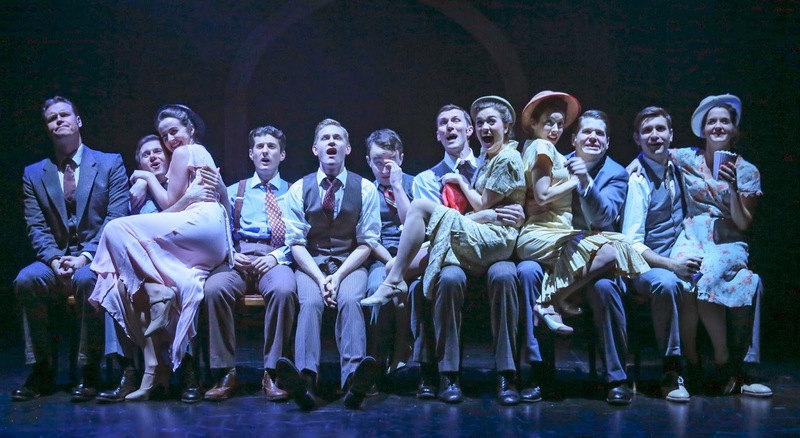 In Prospect Theater Company’s new musical The Underclassman, the collegiate life of literary legend F. Scott Fitzgerald is explored, dropping clues into what made him the person we know today. With music and lyrics by Peter Mills and a book by Mills and Cara Reichel, The Underclassman is inspired by Fitzgerald’s “The Side of Paradise”, which was partially inspired by Fitzgerald’s own life. 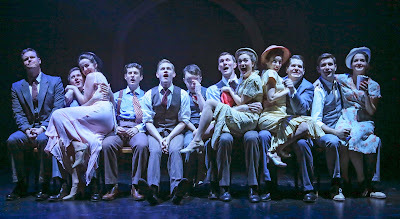 Rather than using the characters Fitzgerald used, Mills and Reichel change the characters back to the Fitzgerald's world and officially turn The Underclassman into a not entirely biographical musical. The story follows a young F. Scott Fitzgerald in his Princeton days as he struggles with school, writing the perfect work, and his first true love, Ginevra King. The Underclassman is a cavity inducing sweet romance but is merely just an underwhelming throwback to the classics. Mills and Reichel’s book is thin. While the subject of the play is enticing, his story is not. Unfortunately this part of F. Scott Fitzgerald's life may not be entirely worthy of a musical. This story should probably only be a scene or two in the big picture musical of his life. And clocking in at a whooping golden age inspired two and a half hours, there is too much fluff within the book that easily could be trimmed to bring the musical to the intermissionless world. Discovering the intricacies of Fitzgerald’s early life that defined his later life is engaging, but the journey we see on stage is quite monotonous. Fitzgerald was confidently stubborn from start to finish in The Underclassman and we don’t see him change until he goes to war, which is just a blip in the grand scheme of the musical. And even so, his wartime life was spent, again, chasing after a girl. As a whole, Act II was a bit messy, especially since the finale of Act I where he gets the girl could have been the end of the show. Mills’ score is a stunning throwback to the turn of the century jazz feel. The music is smart and beautiful, with many toe tapping numbers, but many of the numbers were far too similar to be memorable. The greatest problem as the piece stands now was the finale. Theatrically, it was a fun and powerful moment showcasing the Triangle Club and transforming the world to wartime, but it was a jarring change as the only person who ever mentioned going to war was Fitzgerald’s best friend JP Bishop. Though factual, the book made it feel random. The finale needed to somehow remain in the same world that this piece’s Fitzgerald was living in. The large cast of The Underclassman did a phenomenal job bringing nonstop fun to the stage. As F. Scott Fitzgerald, Matt Dengler gave an exquisite performance with natural charm. Jessica Grové was beautiful as spunky ingénue Ginevra King. The standout performance in the cast came from Marrick Smith as JP Bishop. Smith offered a raw and true performance. “A Place Apart” was one of the most beautiful songs and moments in the entire piece. It’s a shame Bishop and Fitzgerald’s relationship wasn’t given more time to be explored. Piper Goodeve as Fitzgerald pinner and Ginevra’s roommate Marie “Bug” Hersey seemed oddly cast. Goodeve appeared much older than the rest of the ensemble. Goodeve’s seemed best suited and at ease when she impersonated Ginevra’s mother. Jordan Bondurant, Jason Edward Cook, and Christopher Herr contributed some of the minor roles’ best moments. Cara Reichel, who served as director as well, brought great theatricality to The Underclassman. She kept the momentum moving and brought the period to life in a striking manner. Reichel’s ingenuity was much stronger in the director’s chair. Scenic designer Ann Bartek’s glory piece, the grand archway, was a brilliant feature bringing great depth into the space. Keeping all of the furniture pieces on wheels was a great aid to Reichel’s staging. With all the pieces in place, it was unfortunate that the abundance of black masking throughout the theater hindered the world. While the options may have been limited, it took away from all the beauty and color of Sidney Shannon’s costumes. Shannon paid attention to detail with every single costume on stage. She added the right amount of color splash while maintaining the well-to-do black and white world. The choreography by Christine O’Grady was quite wonderful and used Baretek’s scenery to her advantage. After Prospect Theater Company had a monster hit like Jasper in Deadland, The Underclassman had enormous shoes to fill. The Underclassman is a crowd-pleaser for those who yearn for the musicals of yore. But with the trends of modern musicals, The Underclassman doesn’t quite fit in and will soon be forgotten.